There are few men across county cricket more influential to their side than Lancashire’s Steven Croft. You can now add club captain to Middle-order batsman, off-spin bowler and standout fielder on the list of Croft’s roles within the Red Rose unit. Having assumed the captaincy on a temporary basis last season, following injury to Tom Smith, Croft lead the side to promotion from Division Two of the County Championship and skippered Lancashire to their first T20 title. 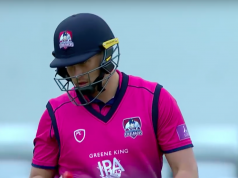 Now, the Blackpool born all-rounder has become club captain on a full-time basis and has set his sights on leading his young side to further success at the highest level. Croft wants the team to challenge for the Division One title but admits that just surviving in Division One will be a step forward for Lancashire, having yo-yoed between Division One and Two since claiming the top flight title in 2011. “It’s a great honour for me to have been named club captain,” Croft said at the club’s annual media day. “Last year the role was perfect for me. I got to do it over three forms and the four-day cricket was my first real go at it. “Division One has been difficult for us lately, but we want to win the division like we did in 2011. We have been given the underdog title but we’ve probably got a better squad than we had then. You don’t play on paper though and it’s about going out there and performing. But we’re very confident. There could hardly be a better role model for young players than the evergreen Croft. He made his first-class debut for the club back in 2005 and has 130 First Class matches under his belt. In T20 cricket especially Croft has become indispensable at Old Trafford, playing 118 consecutive T20 matches for Lancashire, the last being the T20 Blast Final win back in August, helping the Red Rose to boast one of the most impressive T20 win ratios in the world game. That is a record that only Indian superstars Suresh Raina, Virat Kohli and MS Dhoni can beat and one that sets Croft up perfectly to be an inspiration to the plethora of young talent bursting out of the Lancashire squad. England’s greatest ever bowler and Lancashire star James Anderson has no doubt that Croft will make a success of being the club captain. “He will lead from the front by example, the way he throws himself around and gets stuck in,” Anderson said. “That rubs off on everyone else in the team. All the younger lads look up to him. Crofty is so passionate and has a lot of passion for the club and that will ooze out of him. “He might not be the most vocal, you won’t get many Churchillian speeches from him before we go out on the field. But he will use those around him. Lancashire have lost Paul Horton and Ashwell Prince from the promoted side of last season, placing even more importance on the role of the remaining senior players and, in particular, Croft. While many will look upon Lancashire as candidates to be involved in a season-long relegation battle, there is a steeliness and a determination about their new skipper that suggests the club can defy those expectations. While many at media day were talking of Division One stability and consolidating at the highest level, Croft dared to mention the prospect of a title tilt. That is an attitude that he will be determined to instill in his side and, if that confidence can indeed rub off on his team mates, Lancashire may well surprise one or two this season.